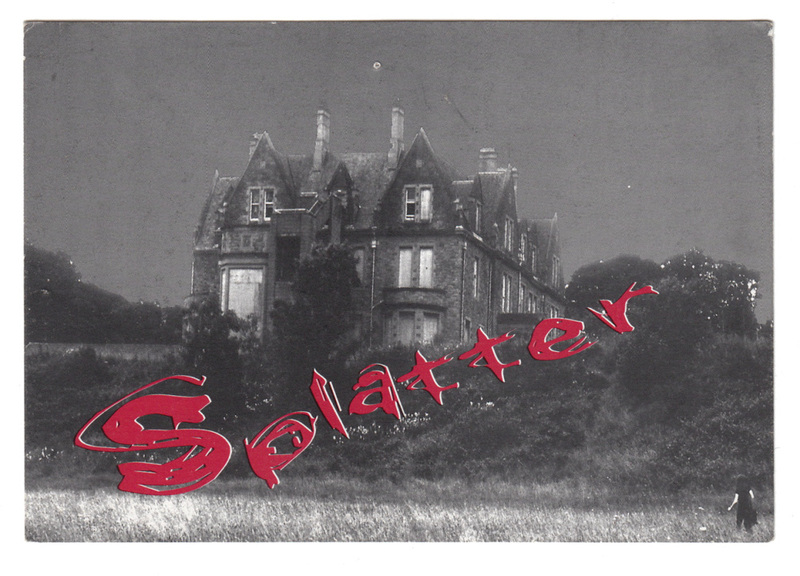 Made for Splatter, a 24 hour exhibition event held at Crawfordsburn House on Halloween night 1996. Plasticine guts spill from the open stomach of a white fur fabric rabbit. 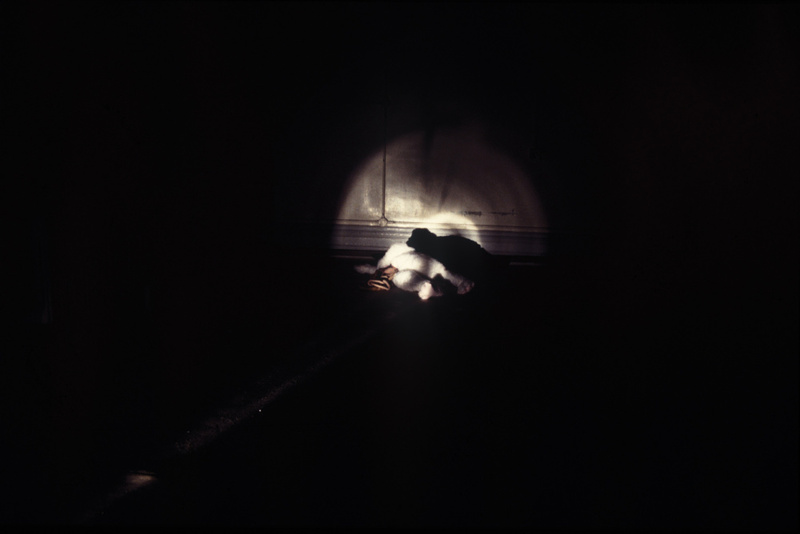 Lying in a large darkened room in the derelict house and illuminated by a torch, Rabbit With Guts combines elements of kitsch, cartoon and horror. Reminiscent of a fairground prize that has been mutilated, the work is a macabre piece, suggestive of a recently discovered murder. A send up of the comical and sentimental Rabbit With Guts draws reference to B-movie genre. 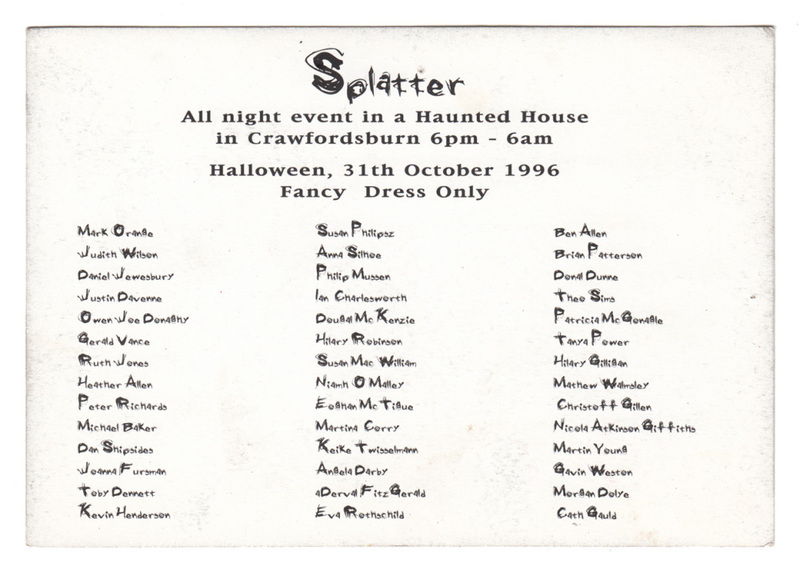 Made for Splatter, a 24 hour exhibition event curated by Catalyst Arts, Belfast and held at Crawfordsburn House on Halloween night 1996. Plasticine guts spill from the open stomach of a white fur fabric rabbit. Lying in a large darkened room in the derelict house and illuminated by a torch, Rabbit With Guts combines elements of kitsch, cartoon and horror. Reminiscent of a fairground prize that has been mutilated, the work is a macabre piece, suggesting a recently discovered murder. A send up of the comical and sentimental Rabbit With Guts draws reference to B-movie genre, Hammer horror films, and the television series Tales of the Unexpected. 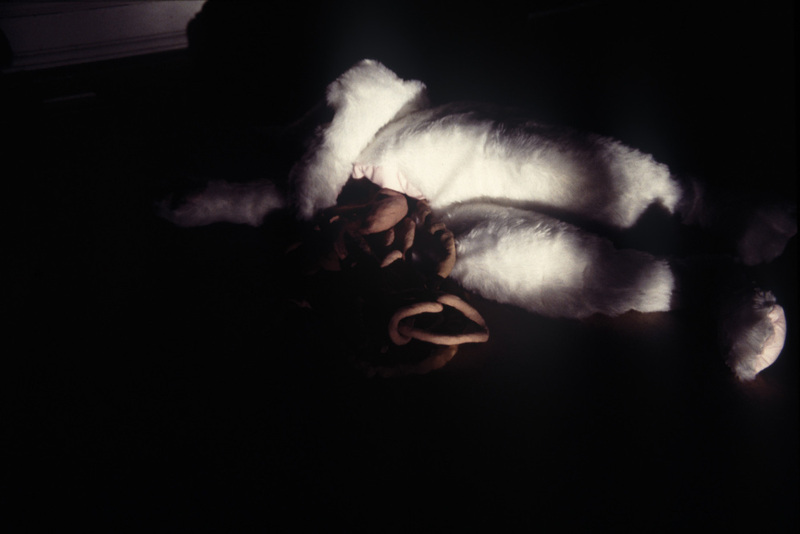 “In an empty room upstairs, again dramatically spotlit as if for the opening or closing of a play, a cuddly bunny lay with its stomach slit-open, its spilt guts gleefully modelled in plasticine. Any material pleasure to be had there could only have been pretty sick and offered proof, finally, of the corrupting influence of cinema and theatre on impressionable minds”.